I'm a day late, but here's what I worked on last week. Surprise, I've started something new. I was hoping to get it made and given to TAPS, an organization that does a yearly event for families of fallen military. But the deadline is earlier than I thought it would be. Maybe I'll save this for next year. 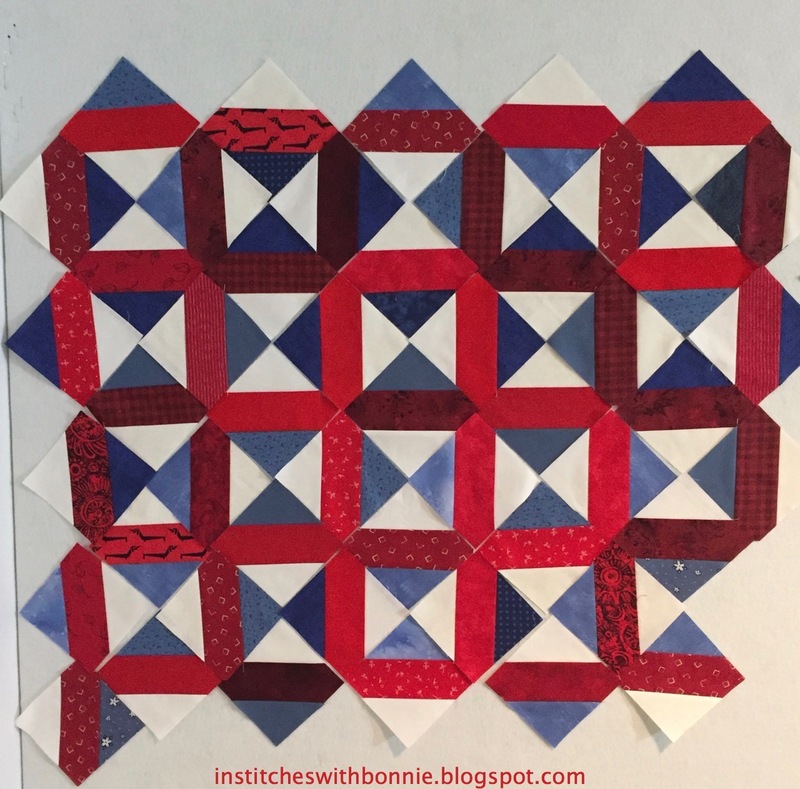 Last year I got one quilt done but I can't find where I might have blogged about it. So, here's the picture I thought I was putting in the blog last year but evidently didn't. I don't even have a picture of the whole quilt. Gee whiz! Bummer. I also made thank you blocks for Faithful Circle Quilters officers who will not be continuing on. Sharon and I had a sewing day Sunday before I left on Monday. So these are both of ours for 5 people. From left to right -- one gal just wanted 5" batik squares, one wanted jewel tone batiks and white, one wanted teal and lime green, one wanted black and white magic 9 patches and one wanted 16 patches. On that one mine is the top (on far right.) 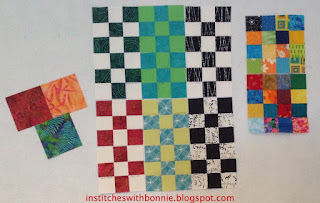 I decided to pull a print 2.5" square from my collection of squares and then I pulled fabrics to go with it. Sharon just pulled what she liked together. It's always nice to be able to go to the collection of 2.5" squares and actually be able to USE them. Here's the goal list for last week. I didn't do very well on that. Work Faithful Circle Quilt Show Lots of fun! And here is what I'll be doing this week. I need to finish the doggy quilt (Slide Show) and get it to someone who is going to the MAESSR picnic on Saturday. And, then it is time to get serious on my OMG goal this month. Maybe this week I'll be more successful than last week. I'm linking up with Monday Makings, Main Crush Mondays, Freemotion by the River (when it is posted), and Sew Cute Tuesday. Sit down with a cuppa and enjoy some quilty inspiration. Love the guild blocks - such a variety and very attractive. 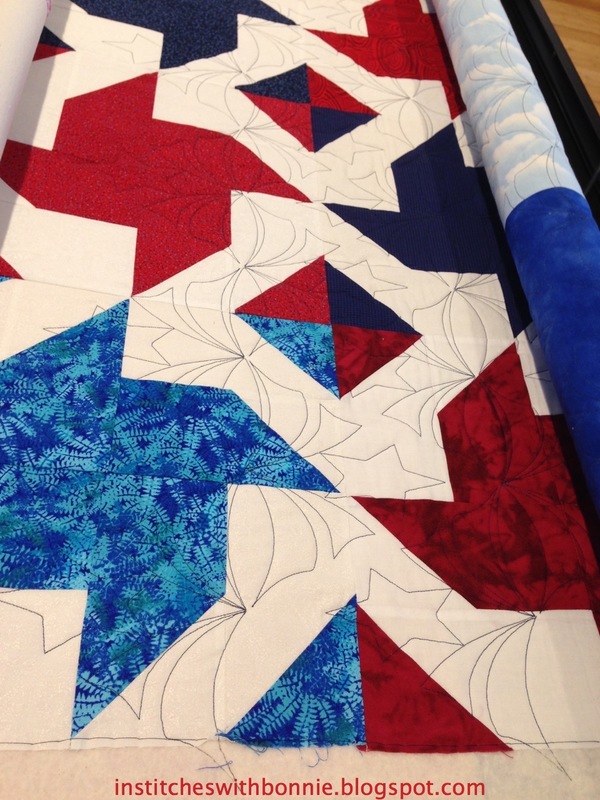 You may not have achieved all your goals, but at least you had great fun at the quilt show. That's what life is about. Good luck with this week's goals. Looks like you didn't do all that badly with last week's.